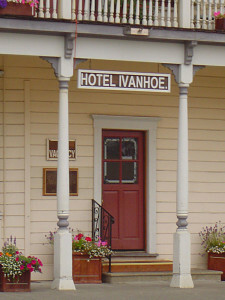 The Hotel Ivanhoe, built in 1870, is one of Ferndale, California’s earliest hotels, and the only original hotel still standing. It is also the oldest building in Ferndale’s nationally recognized historic district. Originally named Robert’s Hotel, after its first owner, it was soon renamed The Ferndale Hotel. Major additions and remodeling in the 1890s created the exterior much as you see it today. Situated near the intersection of Centerville Road and “The Wildcat”, the mountainous road to the Bear and Mattole River Valleys, the Ivanhoe was an ideal overnight stop for visitors from outlying communities and ranches. In the early 1900s the hotel was once again renamed, and it has been known as the Hotel Ivanhoe ever since. In 1996, Dave and Barb Mogni purchased the building and were encouraged by many townspeople to restore the building to its original use. Dave’s grandparents were among early Italian immigrants to the Eel River Valley and they spent many happy social hours at the Ivanhoe with friends and families who had come from Italy. The hotel’s lobby has been restored to its Victorian grandeur, and features the original unique double staircase. Since the saloon, restaurant and lobby re-opened in 1997, the Ivanhoe has been described by patrons as warm, elegant, beautiful, homey, and fun. The lobby has been the scene of many small receptions and parties. The four upstairs guest rooms were completely restored and re-opened in the spring of 2001. The rooms reflect the various periods of the hotel’s history and are decorated with many antiques and historic Ferndale photos. The rooms offer views of the redwood forested Wildcat Mountain, and of Ferndale’s wonderful Victorian lined Main Street. During the holiday season, the rooms provide a spectacular view of Ferndale’s huge community Christmas tree (one of the largest lighted, living Christmas trees in the world). Whatever the occasion, you’ll find your visit to Ferndale enhanced by enjoying it at the Ivanhoe.